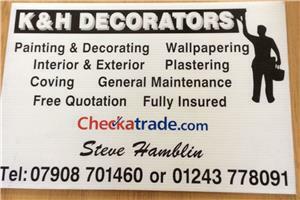 K and H Decorators - Painter/Decorator, Plasterer based in Lavant, West Sussex. Hello and welcome to K&H DECORATORS. We like to offer our services of good high quality work to our customer's . I started K and H Decorators in 2010. I have 18 years of experience in all aspects of painting and decorating.